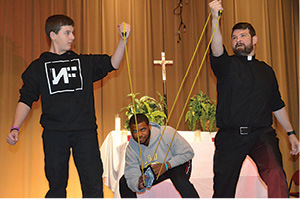 Gospel messages set to the rhythm of electric guitars, drums and intertwining vocals stirred youth to dance, high-five and hug as they entered the Catholic Life Center for the first Red Stick Catholic Fest on Nov. 10. They spent the day connecting faith with the body, mind and soul. With the help of a slingshot, T-shirts flew through the air to Red Stick Catholic Fest attendees hoping to be lucky enough to catch one. The first part of the day featured physical activity. 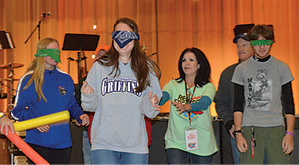 Speaker Mike Patin peppered his talk with bustling activities, including scavenger hunts, following directions with the aid of others while blind folded and others. Patin spun around and ran in different directions as he talked about youths’ struggles as they hear many “voices” clamoring for their attention, such as wealth, status and power. The culture’s messages are often “I want what I want, when I want it,” according to Patin. This results in broken relationships, drama, addictions and other problems, he said. “People get into trouble because they don’t listen to the voice of the one that really matters and loves them – God,” Patin said. He assured youth they are not alone when they suffer for their faith. He nudged them to find truth by listening to the word of God. Riding on the energy of physical activities, youth moved further into the mind and faith connection through an invitation to think about their life’s vocation. A vocations panel, which included a priest, lay faithful, married couple and consecrated virgin, emphasized a vocation is what God places “in your heart of hearts,” that which brings joy, unexpected challenges and God’s companionship. Youth position themselves to catch prizes that were tossed out into the audience. Jesus never promised that following him would be easy, Couri said. “In a divided world, there is no glory in being a Christian,” said Couri. The current crisis in faith is because people don’t believe, refuse to believe or don’t know how to believe, Couri stated. While people have always avoided social maturity, there are more opportunities today because of technology. Instead of facing rejection or awkward moments face to face, people are avoiding such social interactions through text and social media so they “don’t have to deal with it,” according to Couri. God’s desire to encounter people is clear when he became flesh in the person of Jesus, who scandalized some people with the way he accepted those whom they had rejected, Couri said. People today encounter him through the Eucharist on other people. Couri’s conversion came through a priest who listened to her and did not make her conversion the object of their discussions. “It took a long time for that relationship to brew,” said Couri. With body and mind connections made, Red Stick Fest culminated with the soul connection, beginning with a period of quiet reflection before Mass. Contestants try to be the first one to wrap streamers around their arms in one of many activities during the day to see who would win the Battle for the Red Stick. 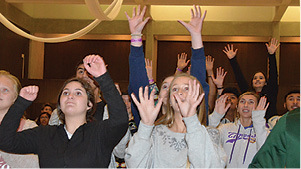 In his homily, Bishop Michael G. Duca encouraged the youth to “give what you have” to God. Bishop Duca connected the Sunday Gospel reading, the poor widow offering two small coins to the treasury, to Jesus’ multiplication of five loaves and two fish to feed a large crowd. The bishop reflected on his early years of high school when he compared himself to popular people who were “cool.” But as his faith grew, he realized God called him to offer what he had. “It’s not about the quantity or size of the gift, but the heart of gift,” said Bishop Duca. The desire of the Holy Spirit is for people “to do something,” according to the bishop. “It’s the Holy Spirit moving you to be like Christ to others,” Bishop Duca said. Saying “hello” and asking to join someone sitting by him or herself at lunch at school or offering to help someone is a good way to do this, he noted. The inflatable gladiator arena was popular at Red Stick Catholic Fest. The bishop urged the youth to “bring Jesus what bread we have – the gift of ourselves, our lives, our sacrifices,” place it on the altar and watch what the Lord does with it. After receiving the body and blood of Jesus in the Eucharist at Mass, Bishop Duca helped the youth continue communing with God through eucharistic adoration. Before adoration he told the youth not to be afraid to speak to God and let God speak to them. 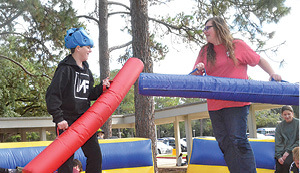 Youth groups were awarded points for placing in activities during the day in the “Battle for the Red Stick.” The victors, St. Joseph Church in Ponchatoula, gleefully lifted up the red baton. 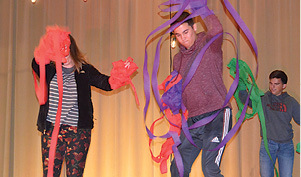 Red Stick Fest attendees’ favorite moments spanned the event. “I was really inspired by the music,” said Michael Besselmen of Holy Rosary Church in St. Amant. “Before we started I prayed the rosary and it made adoration such a special time,” said David. Blindfolded youth had to maneuver and follow directions with the help of a guide during Mike Patin’s talk. 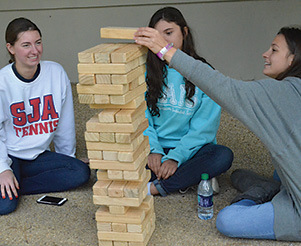 A tumbling timbers challenge was part of the games available during breaks at Red Stick Catholic Fest. 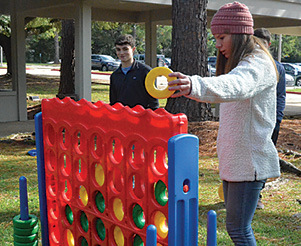 Youth strategized in a Connect Four game at Red Stick Catholic Fest.